In 1985 a group of citizens, business professionals, and elected officials gathered in Gaylord to explore the feasibility of enhancing post-high school educational opportunities in Northern lower Michigan, for both college bound and technical trade students from throughout the region. A new collaborative model was incorporated, the Alpine Regional Education Center (AREC), and two colleges began to offer classes on campus to 22 students. Within ten years, 4 more college/university partners were providing courses toward degree completion. With such proven success, and the need to expand instructional resources, taxpayers in Otsego County voted their support with a 20 year millage to build and operate a new state of the art facility, newly named the University Center at Gaylord. Currently, hundreds of students are served annually by our many college and university partners. With access to the University Center’s advanced computer labs, interactive television, instructional technology, and spacious classrooms, students can excel in their learning. Businesses can also arrange meeting space at the University Center to take advantage of the superior classroom resources. 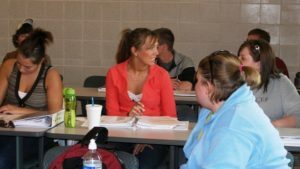 For life long learners, community education classes are available each semester. These classes cover a wide area of interest, such as photography, gardening, art, foreign language, computer science, cooking, and other requested topics. Special summer classes for kids give them fun, hands-on, real-world opportunities to learn robotics, environmental science discovery, electronics and other interesting fields. With growing success across a broad educational spectrum, the University Center Gaylord is well positioned to continue to offer students the resources they need, and the variety of academic programs that fit their interest. In compliance with the Freedom of Information Act, we have published the attached University Center Gaylord policy, guidelines and forms.